Today is a historic and fantastic day for the kids of New York, although chances are few of them know it. Today, the Child Safe Playing Fields Act goes into effect in the state, prohibiting the use of pesticides on school grounds at all schools, public and private, up to grade 12, and including daycare centers. To celebrate the occasion, Patti and I visited legislators in Albany yesterday to thank them for their hard work on this issue, and congratulate them for doing such a great job. The New York legislation is a model for all states. As the song says, "If we can do it here, we can do it anywhere." 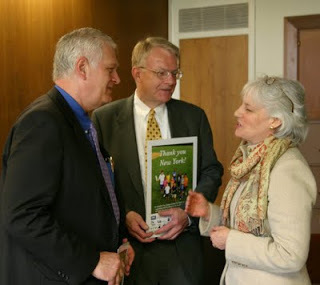 Here's Patti talking with the two prime sponsors of the bill, Assemblymen Steve Englebright and Robert Sweeney. The poster in Sweeney's hand is the "Thank You, New York" poster we created, which was signed by almost every environmental and health organization in the state. You can see the full-resolution poster here.